It’s official, my little neice Martha is on the move. She’s a quick learner, like her uncle, and on the eve of being seven months old she has mastered the art of crawling. From a very early age she seems to have had a fascination with nature and the great outdoors. Perhaps it’s an illusion, but I prefer to think not. So far we’ve had to bring the world’s sights, sounds and smells to Martha, but her new found mobility means she can now approach things at her own pace. 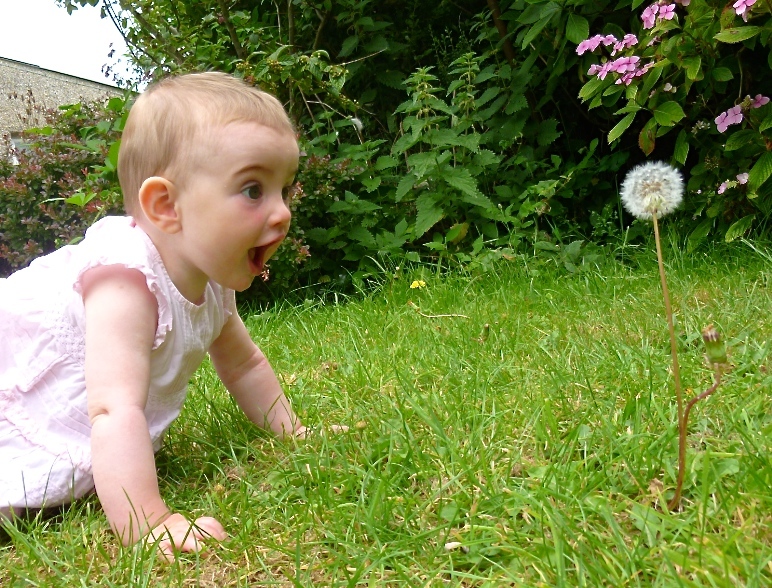 Martha’s look of wonderment at this delicate dandelion clock is priceless. Somehow my sister managed to capture her at just the right moment; a picture for the family album indeed. I hope Martha’s love of plants, flowers and animals grows, as my own did, and that she cherishes such things in future. I have two girls and yes there was a little garden chaos but the joy of sowing seeds together and watching garden wildlife, our love of flowers, growing our own fruit and veg and eating together. You will have a great time and have much to share with your beautiful niece. Total magic!!!! Such wonderful innocence and beauty. Such a great picture! – she shows great potential! I think it may be best that I don’t tell proud Uncle Dan that moments after this picture was taken Martha ruthlessly decapitated the dandelion and then proceeded to eat it…..From Martha’s mum.